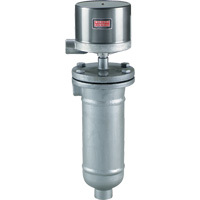 A removable stainless steel float enclosed in a flanged carbon steel chamber is featured in the durable, field proven 211 Series. External side mount series includes 1" NPT process connections as standard, or with socket weld hubs; or, 1" flanges as options. Pressure and temperature limits are 450 psi (31 bar) at 100°F (38°C), and 300 psi (21 bar) at 500°F (260°C). Minimum specific gravity for all models is 0.60. The models shown can be ordered with a variety of electrical arrangements including SPST, SPDT, or DPDT circuits in hermetically sealed snap action or mercury contacts. Switches can be ordered open on level rise or fall. Single pole double throw electrically independent circuits are available as well as low current or high DC current applications. A full range of enclosures are offered including general purpose NEMA 1; weatherproof NEMA 4X; (explosion-proof) and (explosion-proof/vapor-proof) Groups B, C, D, E, F, G, NEMA 7, 9. Switch Type: Snap or mercury switch. See charts A and B on Model Chart. Electrical Rating: See charts A and B on Model Chart. Wetted Parts: C1 construction. Chamber: carbon steel; Trim: 303SS, 304SS, and 430SS (316SS and 430SS optional). EXAMPLE 211 WT 7810 C1 60 211-WT-7810-C1-60 Liquid Level Control, weatherproof enclosure, SPDT snap switch, fixed deadband, automatic reset, operating pressure 450 psig (31 bar) at 100°F (38°C), 300 psig (21 bar) at 500°F (260°C), side/bottom process connections, 1" NPT, minimum specific gravity 0.60. †Available on special order, change 1st digit in ordering code from 4 to 5 or 7 to 8, i.e., -4820 becomes -5820, -7810 becomes -8810, etc. ‡10 amp inductive (polarized) at 125 VDC.